It's no secret that the marriages of monarchs are often made in hell. Here are some of the most spectacular mismatches in five hundred years of royal history.... In a world where many kings, queens, and princes lacked nothing but true love, marital mismatches could bring out the ... read full description below. It's no secret that the marriages of monarchs are often made in hell. Here are some of the most spectacular mismatches in five hundred years of royal history.... In a world where many kings, queens, and princes lacked nothing but true love, marital mismatches could bring out the baddest, boldest behavior in the bluest of bloodlines. Margaret Tudor, her niece Mary I, and Catherine of Braganza were desperately in love with chronically unfaithful husbands, but at least they weren't murdered by them, as were two of the Medici princesses were. King Charles II's beautiful, high-spirited sister Minette wed Louis XIV's younger brother, who wore more makeup and perfume than she did. Forced to wed her boring, jug-eared cousin Ferdinand, Marie of Roumania--a granddaughter of Queen Victoria--proved herself one of the heroines of World War I by using her prodigious personal charm to regain massive amounts of land during the peace talks at Versailles. 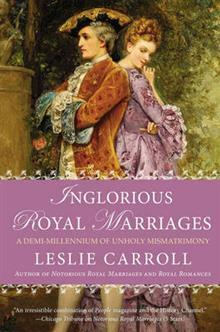 Brimming with outrageous real-life stories of royal marriages gone wrong, this is an entertaining, unforgettable book of dubious matches doomed from the start.